Happy birthday to Sir Sean Connery. Think you Dr No everything about one of Edinburgh’s most famous sons? Sir Sean Connery turns 85 today and to celebrate we have put together 85 well-known and perhaps not-so-well known facts about the acting legend. Shhho, without further ado it’s Happy Birthday Big Tam! 1: Thomas Connery was born at 176 Fountainbridge to Euphamia Maclean and Joseph Connery. He has a younger brother, Neil. 2: His father’s family were from County Wexford in Ireland. His grandfather, Tommy Connery, was a rag and bone man. 3: Young Connery’s mental arithmetic was said to be as good as any bookie. 4: His mother’s family came from Kirkcaldy, where the Connerys would spend holidays. 5: His father worked at the North British Rubber Mill, while Euphamia was a cleaner. 6: Home was a top-floor flat with a single bedroom, kitchen/living room and outside toilet. It was demolished in the Sixties. 7: He went to Bruntsfield Primary and says learning to read and write aged five was the foundation for his acting career. 8: He turned down Boroughmuir High because rugby was the main sport. Instead he attended Darroch Secondary on Upper Gilmore Street. 9: He joined the Sea Cadets Corps and learned to box. 10: He fished at the Union Canal, using Euphamia’s old stockings as a fishing line. 11: He started smoking when he was ten years old. 12: When his school closed during the war, pupils were sent to classes at a Morningside manor house. Connery was refused entry by the “lady” of the house because she recognised him as her milk boy. 13: He left school at 14 to work for St Cuthbert’s Co-operative Society at its Corstorphine Dairy as a barrow worker. 14: He recalled having to push his milk cart pony, Titch, up the icy slope of Dean Bridge. 15: The job was organised through Alex Kitson, a neighbour. He became general secretary of the Transport and General Workers Union. 16: The milk round included Fettes, attended by a young James Bond in one of Ian Fleming’s novels. 17: Connery was 16 when he joined the Royal Navy for seven years. 18: He was discharged aged 19 with a duodenal ulcer. 19: He was awarded a navy pension of six shillings and eight pence a week, around 33p. 20: He returned home with two tattoos, one saying “Scotland Forever” and the other “Mum and Dad”. 21: He worked as a doorman at the Fountainbridge Palais de Danse dance hall and as a brickie. 22: He also trained as a French polisher in Haddington and spent nights sleeping in one of the coffins, apparently to save the bus fare home. 23: The job gave him his first taste of acting as he’d regularly work on the sets at the King’s Theatre. 24: At one point he installed the printing plates on to the presses of the Edinburgh Evening News. 25: He also famously posed as a male model at Edinburgh College of Art. The cash helped pay subscriptions to Dunedin Weightlifting Club. 26: One of the artists there was the one and only Richard Demarco. 27: Connery played football for Fet-Lors, run for the city’s “poorer” citizens by students at Fettes College and Loretto School. 28: He also played for Bonnyrigg Rose and was offered a trial with East Fife. 29: In 1952 he worked at Portobello open air swimming pool as a lifeguard. 30: His physique got him noticed and he was asked to join Anna Neagle at an Empire Theatre production, Glorious Days. 31: She encouraged him to consider an acting career. 32: He entered Mr Universe in 1953, and prepared by sunbathing on Gullane beach. 33: He was dubbed “Mr Scotland” during the competition, and took third place. 34: It led to an audition for a role in a touring production of South Pacific. 35: Connery marked the Drury Lane role by changing his first name to Sean. 36: While on tour he was spotted playing football and reportedly offered the chance to sign for Manchester United. 37: He fell in love with actress Carol Soppel, who sang Happy Talk. 38: He later romanced Julie Hamilton, step-daughter of politican Michael Foot. 39: He took elocution lessons to polish his Edinburgh accent. 40: His big television break came in 1957, in the live BBC television play Requiem for a Heavyweight. 42: In late 1957, he signed a long-term movie deal with 20th Century Fox. 43: His first Hollywood role was Another Time, Another Place. 44: His film career stuttered and he returned to TV to star alongside Diane Cilento in Anna Christie. He later married her. 45: Connery turned down the lead in El Cid after Cilento caught TB, so he could look after her. 46: Film producer Albert Broccoli’s wife first spotted Connery’s potential for the role he’d become famous for – James Bond. 48: He signed a six-year deal as James Bond and began filming Dr No in 1962. 49: United Artists was so unconvinced by Dr No, it premiered the film in the American Midwest to avoid negative reviews. 50: Connery and Cilento’s son, Jason, was born in January 1963, six weeks after the couple married. 51: The couple’s turbulent marriage lasted 11 years. 52: He sparked outrage in 1987 when he commented in an interview that it was acceptable to “slap” women. 53: Connery wore a wig for all his Bond appearances. 54: He used his £1.2 million salary from Diamonds are Forever to set up the Scottish International Education Trust to help young artists. 55: In America, he launched the Friends of Scotland charity to raise the profile of Scotland through events such as Dressed to Kilt. 56: He is well-known to be passionate about golf but had no interest until making the Bond film, Goldfinger, which features a golf scene. 57: He played on the first golf course in the Soviet Union in 1989 while filming John Le Carre’s The Russia House. The Moscow City Club had nine fairways constructed around high-rise tenements. 58: He met Moroccan artist Micheline Roquebrune at a golf tournament in Casablanca in 1970. 59: Within three months he had quit the London home that he shared with Cilento. 60: He divorced Cilento in 1973 and married Micheline in May 1975. 61: He retired from his Bond character following 1971 movie Diamonds are Forever, vowing never to play 007 again. 62: He went on to perform in The Man Who Would be King in 1975 alongside Michael Caine in what’s considered one of his greatest performances. 63: He did play Bond again when the role was revised in an “unofficial” 1983 Bond movie. 64: Micheline suggested its title: Never Say Never Again, a reference to her husband’s insistence he’d left Bond behind. 65: His film awards include an Oscar in 1988 for his role as Jimmy Malone in The Untouchables, two Baftas and three Golden Globes. 66: He received £250,000 for two days’ work on Robin Hood, Prince of Thieves in 1991 and gave it to charity. 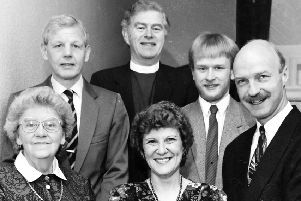 67: He was made a Freeman of Edinburgh in 1991. 68: He had radiation treatment in 1993 for nodules on his throat. 69: That year he was erroneously announced as dead by Japanese and South African news agencies. 70: In 2006 he had surgery to remove a kidney tumour. 71: He was voted People magazine’s ‘sexiest man alive’ in 1989. 72: He was knighted in 2000. 73: In 2002 he was named Greatest Scot of the 20th century, beating John Logie Baird and Alexander Graham Bell. 74: In 2008, aged 78, he was photographed by Annie Leibovitz for Louis Vuitton’s advertising campaign. 75: Hollywood hardman Steven Seagal once broke Connery’s wrist during a martial arts lesson. 76: He retired from acting after The League of Extraordinary Gentlemen. 78: A staunch Nationalist, he famously insists he won’t return from the Bahamas to live in Scotland until it is independent. 79: He has been a high-profile supporter of the Edinburgh Film Festival. 80: He returned to Fountainbridge to unveil a plaque marking his place of birth and celebrating his contribution to Scottish cinema. 81: His favourite Bond film is said to be From Russia With Love. 82: He was once stopped for speeding by an officer named Sergeant James Bond. 83: Sam Mendes confirmed that Connery was considered for the Kincaide role taken by Albert Finney in Skyfall, but said the idea was shelved as being distracting to the film. 84: He starred in seven Bond films in all between 1962 and 1983 and was the tallest actor to play Bond. 85: In 1992, he formed a production company in Hollywood – Fountainbridge Films.